A combination of a poor first half, a penalty miss, superb saves and last ditch defending, saw AFC Dunstable drop their first points at home in the league this season, held 1-1 by Cockfosters. There was one change to the side who had won 5-2 at Leverstock Green last Saturday as Fabio Bufano came in for Danny Ryan. AFC nearly took the lead after six minutes when a flying run down the right by Taishan Griffith saw his far post cross cushioned by Brandon Carney into the path of Leon Cashman whose strike just cleared the bar. The hosts couldn’t get going after that miss though and Cockfosters had the lead on 23 minutes when indecision by Ricky Perks and Bufano saw Shane Reid nip in to head home. After stern words by manager Steve Heath in the break, AFC started to lay siege on the visitors goal. Unfortunately they found keeper Ravan Constable in inspired form as he bravely came and collect all the deliveries that AFC pumped into the box. Brandon Carney beat him with 57 minutes gone to make it 1-1, but Constable upped his game even further. He made an outstanding stop on 67 minutes, somehow tipping over a bullet header from Bufano, while Constable then saved Josh Humbert’s effort from the resulting corner. AFC continued to bombard the Fosters goal and BJ Christie saw his shot saved at point blank range. 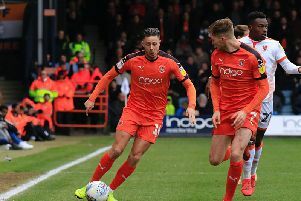 However, with three minutes left, Christie was impeded in the area as AFC were awarded a penalty, while Evans Omondi was sent off for his second yellow card. Newman Carney, who is usually deadly from the spot, crashed his shot against the crossbar as AFC couldn’t break through. A frustrated Heath said: “We threw away the two points with our first half performance. “I know we dominated the second half but it gave us a lot to do after the break. “If we could have applied ourselves a lot better and maybe taken a first half lead, that meant Cockfosters would have to come out a bit more, but they decided to try and protect their lead and defended unbelievably. The result means AFC stay top of the table with a four point lead over Hertford Town. AFC: Perks, Massay, N Carney, Bufano, Griffiths, Griffith, B Carney, Olaleye, Cashman, Humbert, Christie. Subs used: Beck, Byron. Subs not used: Jones, Ryan.